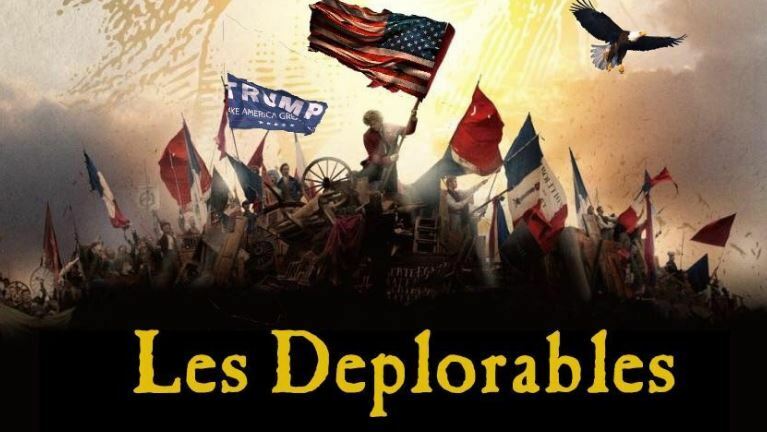 “Prior to the election of Donald J Trump, the US was on an economy wrecking trajectory, set by renewable energy rent seekers and the eco-zealots that champion their cause: numerous American states, not least Texas and California, as well as the prairies of the mid-west have been overrun with costly and chaotic subsidised wind and solar. 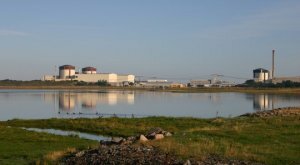 Power prices in those states inevitably skyrocketed – wind and solar ‘powered’ Californians pay 40% more for power than the US average – threatening homegrown American industry and hundreds of thousands of blue-collar jobs. WESTERN climate-theory-obsessed governments continue to ramp up unreliables – wind and solar – that continue to fail dismally wherever they are installed. Energy poverty, sky rocketing power bills, grid instability and the destruction of pristine landscapes, flora and fauna among the many costs of low energy-density, weather dependent novelty ‘energy’ sources! EITHER, green propaganda is beyond successful or lucrative kickbacks for politicians who give the ‘green’ light are too good to refuse. A combination of both seems likely. Another example of the obvious inadequacy of part-time unpredictable wind power, and its consequencies for countries that insist on pursuing it. Relying on imports to avoid power shortages can’t be ideal for any country. AUSTRALIA’S once key economic advantage and proud boast of having the cheapest power prices in the world has been sacrificed at the altar of climate change by its politicians’ obsession with global warming theory and subsequent mad rush into large-scale unreliable ‘energy’ sources – wind and solar. BIPARTISAN appeasement to the UN climate gods has come at a major cost to Australian businesses and households, now exposed to some of the highest power prices in the world, South Australia officially the highest. Throughout the western world over the last 20-30 years in particular, we have witnessed the tightening hand of the state, which has become ever more bold in insisting where and how we live, who we can work for or employ, what we can say and think, whose car we can get into, whose home we can stay in, and what we’re allowed to put into our mouths. But these remarks are about how government intervention has destroyed the electricity market in Australia and throughout much of the western world, and what it means for personal and economic liberty, now and in the future. Let me start by outlining what a market should be, and how it should work with electricity. A real market is simply a place where consumers and producers meet, and agree on a price and means to satisfy consumer demand. A real electricity market is one open to all fuel technologies – coal, gas, uranium, wind, water or the sun. Where producers compete to grow market share and increase their profit based on efficient production, with all consumers – household and business – the winners. DEAR German “Greens”, who played a major government and activist role in phasing out (CO2-free) nuclear energy, via Fukushima hysteria, and implementing the economic and environmental disastrous #Energiewende, I repeat to you again – “careful what you wish for”! A 19th century church in Germany was demolished this week to make way for coal mining. St Lambertus Cathedral – a church known by locals as Immerather Dom – in Immerath, a tiny farming village northwest of Cologne, was razed to the ground on Tuesday. 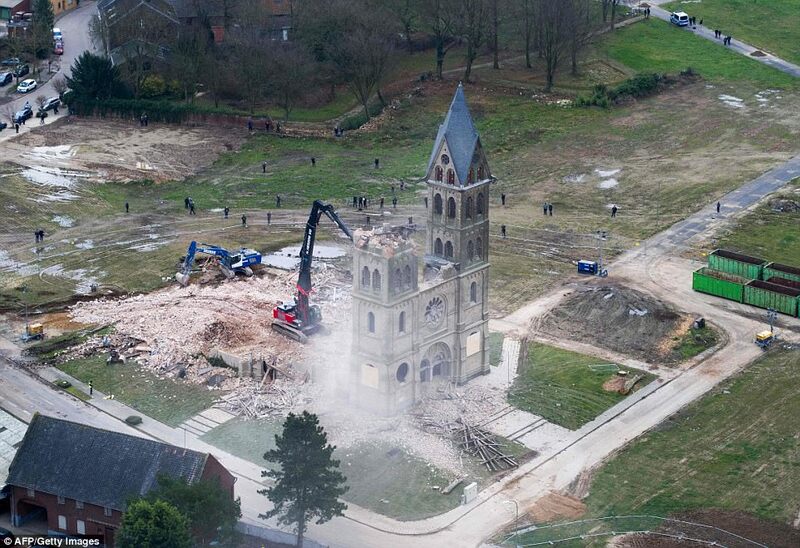 The double-spired church, thought to have been built between 1880 and 1890, was torn down in the latest step in energy company RWE’s demolition of the entire village in a bid to expand its access to the region’s lignite supply. Perhaps instead of lecturing Donald Trump, our climate conscious MPs should be complaining to Mrs Merkel. 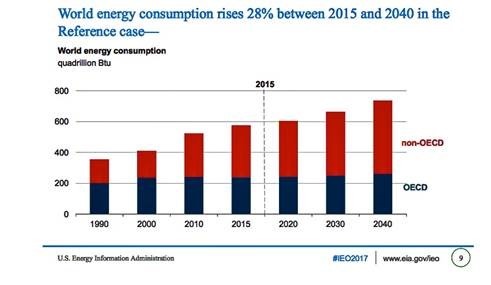 The latest EIA 2017 IEO report projects world energy consumption to increase by 28% from 2015 through 2040. Non OECD countries (the developing nations-China, India, etc.) 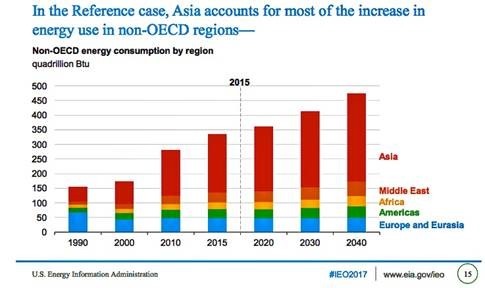 account for about 84% of this increased energy use with non OECD Asia making up the majority of this energy use growth. 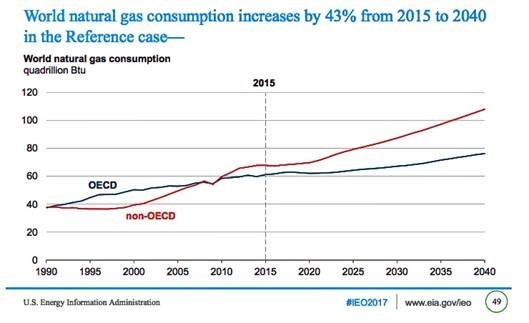 Significant growth (43%) in natural gas use is projected in meeting the worlds total energy increase through 2040. 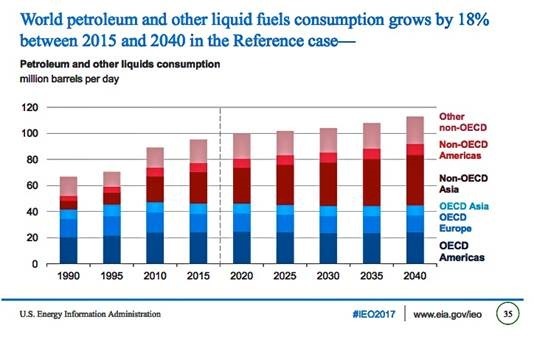 Petroleum and other liquid fuels use growth (18%) continues but at a slower pace than natural gas. 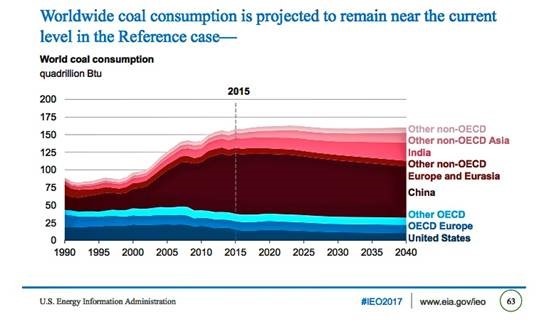 Coal energy use is projected to be stable during this period with declines in China offset by increased use in India. 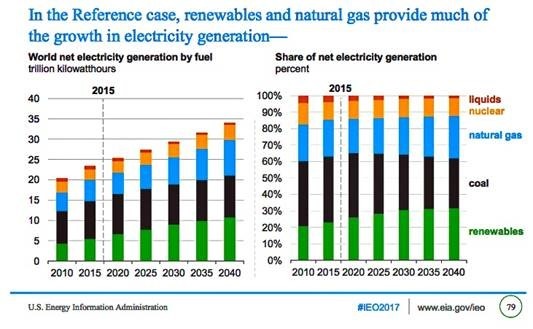 Renewables (hydro, wind, solar, geothermal, other) is the fastest growing energy source with wind, solar and natural gas supplying most of the electricity sector growth.